← 1911: Oakhurst’s first mayor murdered in his front yard! When it was finally time for Atlanta to build a proper water system, after numerous false starts they settled on a spot just a few miles south of downtown. Near the headwaters of the South River a dam was completed 35 feet above the river bed and 350 feet long and by June 1875 was filled 25 feet deep. Within 10 years, the city had already outgrown it and this is when the artesian well (here’s an older post about various wells dug around Atlanta at the turn of the century) was dug 2044 feet deep at Five Points downtown which did produce 200,000 gallons a day but soon that was outgrown as well. By 1893, the whole operation was moved to the current Howell Mill location and Lakewood became a 300 acre spot for rest and boating. The whole of which was leased out for $600 a year to concessioners. There’s so much to say about Lakewood it could easily justify several threads. I just thought I’d comment briefly on the Fair. It was truly one of the highlights of the year. 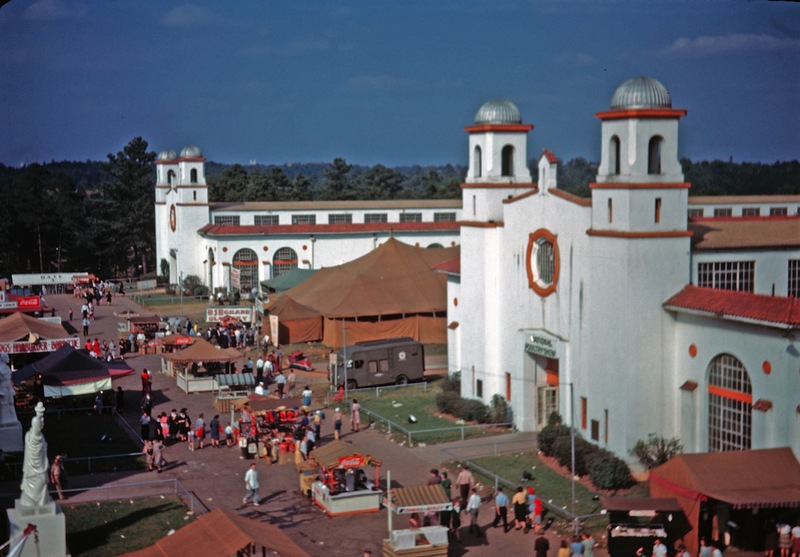 The fair was a whirl of colors, sounds and smells that you don’t find in today’s theme parks and air-conditioned exhibits like the World of Coke and the Aquarium. At the fair the generators and cables and the machinery they powered were all out in the open, humming and crackling with electricity. Tending them were men with tattoos and slicked back hair and mustaches and faces that didn’t look like our daddies and the other men we knew. The smells of the livestock, the grease and gasoline, the baked goods, the popcorn and hot dogs, and the crowd itself and a million other curious things mingled together in the humid Georgia evening in a way that still instantly comes to mind. There were sounds everywhere — sounds you didn’t hear everyday. 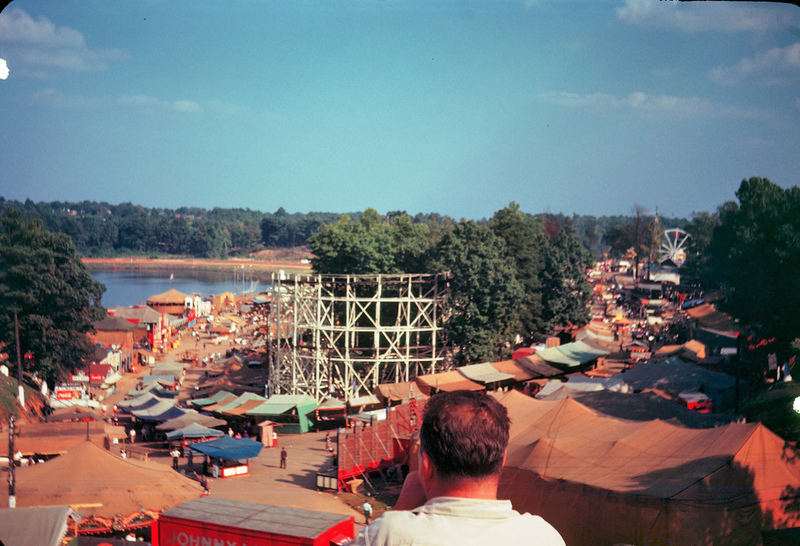 Bells dinging, the cacophony of the gears, pulleys and belts that drove the rides, and the tantalizing whirl of cotton candy machines. Feet on wooden ramps, the shouts of the barkers, tinkling coins, softballs whacking against canvas as their hurlers strove in vain to topple a stack of wooden milk bottles which you would think could be knocked over by my grandma. Well, I could go on, but suffice to say it was certainly a magical time, especially for us kids. Here are … a couple of things that still stick in my mind. One is a photo from 1961 showing the mighty Greyhound. In my mind it dominated the whole park. You could see it and hear its unmistakable clatter and roar from just about any point on the fairgrounds. The second is a picture I took in 1974, coming from the opposite direction. This was shortly before the Greyhound was demolished for Smokey and the Bandit and because it had just become too dangerous. Sadly, I can’t find these photos any more. Then Scott’s Antique Market took over into Shirley Franklin’s time as mayor. Then the most amazing thing happened. Movies! It’s now the home to tons of motion picture sound stages and hopefully will be for a long time. If you want to do some good work with old buildings, the 1920’s era commercial district nearby around Jonesboro Road and Lakewood Ave still largely stands. It’s ripe for redevelopment and I think you’d get plenty of business from the movie folks. This entry was posted in Lakewood, Water. Bookmark the permalink.